Siasia promises different eagles, Amunike admits Nigeria faces tough task - BlogIT with OLIVIA!!! 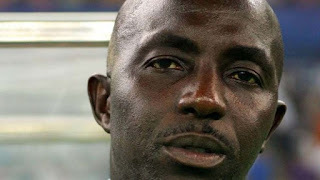 Super Eagles Coach, Samson Siasia, has promised Nigerians that they would see a better performance from his team than they witnessed in Kaduna on Friday when Nigeria met Egypt in the first leg of their 2017 African Nations Cup qualifying series double-header. But the team’s Assistant Coach, Emmanuel Amunike, has admitted that Nigeria faces a tough task in Egypt today. He also declared that the players desire and commitment to play in next year’s African Nations Cup was another factor that would confound the North Africa side. However, although Assistant Coach, Emmanuel Amunike, believes Nigeria can win in Alexandria, he acknowledges that beating Egypt would not be an easy task. Amunike affirmed that from his previous experience with Zamalek, the Egyptians would be strongly backed by their fans in Alexandria. “The game on Tuesday would be different from last Friday’s (in Kaduna) where we unfortunately conceded a late goal. It’s going to be tougher. We would have to apply a lot of wisdom and cannot afford some of the mistakes we made in Kaduna. I wouldn’t subscribe to the notion that we were tactically naive against Egypt in Kaduna because that was a match we would have won with some luck,” he added. Meanwhile, Eagles number one goalkeeper, Carl Ikeme, who did not travel with the rest of the Super Eagles squad to Egypt, has returned to his England base. On Sunday, the Nigeria Football Federation (NFF) announced the Wolvehampton Wanderers was suffering from a stomach upset, which stopped him from training and as such he has been ruled out of today’s game in Alexandria. Ikeme has been Eagles first-choice goalkeeper since September after Lille star, Vincent Enyeama, retired from international football after a major falling out with former coach Sunday Oliseh. South Africa-based Daniel Akpeyi is now expected to be between the posts with Sunshine Stars shot stopper, Ikechukwu Ezenwa his cover. The Eagles landed in Alexandria yesterday afternoon after a six-hour flight ahead of today’s AFCON rematch against Egypt. The team’s departure from Abuja on a chartered flight was delayed by two hours as they sought clearance to fly over Sudan. England-based goalkeeper Carl Ikeme was the only player who did not make the flight as he has returned to his club after he was ruled out of the match due to a stomach problem. Reports have it that hundreds of the country’s supporters were denied entry visas and so could not make the trip to cheer the Eagles to victory in a must-win game. geria Football Federation (NFF) to secure a chartered flight for this trip.